In just two years' time, more than half of notebook computers will use flash memory, according to a new report. Flash memory is faster, quieter, more durable, and uses less power than traditional hard disk drives. By the fourth quarter of 2009, the number of notebook computers equipped with flash disks is expected to boom to 60 per cent, predicts research firm iSuppli . In the first quarter of this year only 143,600 flash memory equipped machines were sold. As prices go down, the use will go up rapidly, iSuppli said. "The shift to flash is being aided and abetted by a dramatic drop in prices for NAND memory," said Matthew Wilkins, principal analyst at iSuppli. 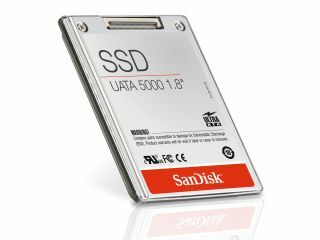 By 2009 the gap between prices of flash memory and hard drive storage will have decreased, according to the report. By then, 1GB of NAND flash memory will cost about 14 times as much as hard drive storage, down from 100 times more in 2003. "But it's not just price that will drive its use," Wilkins said. "The use of flash memory gives better performance than rotating storage because of its faster read times. It also has better shock resistance and offers superior reliability to hard disk drives," he added. By the end of 2009, iSuppli predicts that 28 per cent of ultra-portable PCs will use flash memory. Traditional hard drives will remain in 54 per cent of ultra-portable PCs.